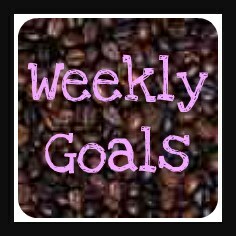 Karla Creative: Weekly Goals - my crazy life! Weekly Goals - my crazy life! Well, oops! It's been a few weeks since I've posted. I know I have said this before, but how on Earth did life get so busy??? Whew. My goals the past couple of weeks have just been to keep up on household chores, the garden, and get the animals taken care of. I can happily say that I succeeded, mostly. Laundry piled up over the weekend but it's not out of control. I spent quite a bit of time working in the garden, especially on weed patrol! I am constantly amazed at how quickly weeds can come up, unlike the good plants that take a while. Good things come to those that wait! Our potato plants are starting to bloom, as are the peas! We have 7 tomato plants already in and another 4 I need to get out there, not to mention the crazy amount of volunteer tomato plants that are popping up! The onions are thriving and soon I will have to thin out the carrots, beets & radishes! I started some seeds in egg cartons last Monday and the cauliflower and okra have already sprouted up. I am not going to have a lot of crazy goals this week as it is filled with school activities for the boys! Plus getting ready for the city wide garage sale this Saturday morning and my cousin's bachelorette party that evening! Looking forward to Mothers Day also - all I want this year is to have all the dishes done (not by me) meals prepared and cleaned up after (again, not by me) and no extra messes in the house! 4. Exercise! I have dropped a few pounds lately and I am only 11 pounds away from the point at which I will be able to ride our horse, but exercise will be key! 5. Get stuff ready for garage sale! 10. Make a hair clip to match the ties for our bridesmaids dresses so I have an option for my hair! I said I wasn't going to have a lot of goals but I guess it's unavoidable! I helped out at the kids' school today in the lunchroom and at recess so that the teachers could have a special lunch in celebration of Teacher Appreciation Week. Wednesday is the 6th grade track meet and G will be doing the 400 meter, high jump and a 4 by 100. Apparently the kid has mad high jump skills and can run like the wind without getting winded (not surprised as he runs everywhere he goes!). Thursday is Bible Study, D's field trip, and G's rocket launch - I am going to be running like crazy that day! Friday there is no school so we will all be helping get ready for the big yard sale! I am really having to work on scheduling things and making an effort to get all the tasks done! We are also working on figuring out what to do about our new (to us) van that needs a new transmission ($$$$$$$). Ah well, so it is with life. God is teaching me to go with the flow and most of all to trust that He will take care of us. I really should have this down by now as He has proven that we are taken care of over & over & over. On the plus side through the stress & worry I am learning to lean more on Him!